The Walmart Keg Style Root Beer is unbranded. It is surprisingly good. It is, in fact, better than many of the national brands we’ve tested. It is a light colored root beer with a very sweet caramel flavor. There isn’t a hint of vanilla or sassafras, but it still tastes like root beer. 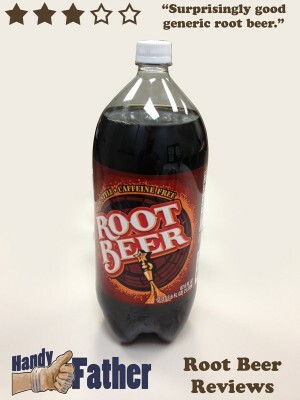 Definitely the best generic root beer we have reviewed thus far. It is also probably the best value for the money as we got a 2 liter bottle for 74¢. This root beer delivers good bang for the buck! Ingredients: Carbonated water, high fructose corn syrup, caramel color, potassium benzoate (a preservative), natural and artificial flavor. Keg style root beer is distributed by Wal-Mart Stores, Inc.
We gave the Walmart Keg Style Root Beer Review a score of 3 stars out of 5. As mentioned previously, you can purchase this keg style root beer at Walmart in the generic, store brand section of the soda isle.